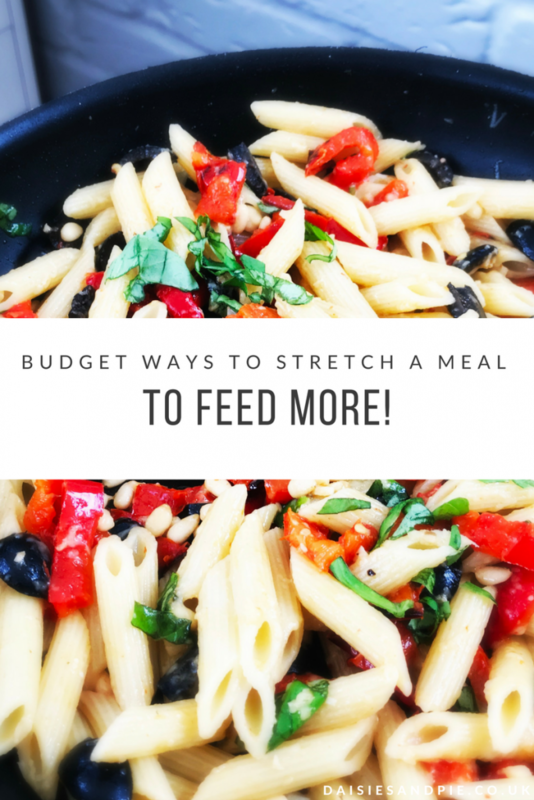 Super simple tips and ideas that will help you stretch a meal to feed more people – frugal and healthy! If you’ve cooked up a panful of stew, curry, casserole or pasta sauce the easiest way to stretch this is to add a tin of beans or pulses, you can pick up tins of beans or pulses from the supermarket own brand ranges for as little as 30-40p. A tin of lentils easily mixes into bolognese sauce and the kids probably won’t even notice it’s there! We also love to mix tinned baked beans into sausage casseroles. Dish up a smaller quantity of the main dish and add lots of veggies on the side – fresh or frozen work just as well here. Add a scoop of sweet potato and carrot mash, frozen broccoli and cauliflower mix and a big spoonful of peans and corn. Simple, quick and healthy. During the summer or warmer months, try to get into the habit of serving a side salad – little dish of greens, pepper strips, cucumber strips, tomatoes all help fill people up. This can be anything from a loaf of bread and butter alongside a dish of casserole, stew or egg and chips! To naan breads and flatbreads to go with spicier dishes and even a couple of cheap garlic baguettes with and Italian recipe will all stretch the meal out further.